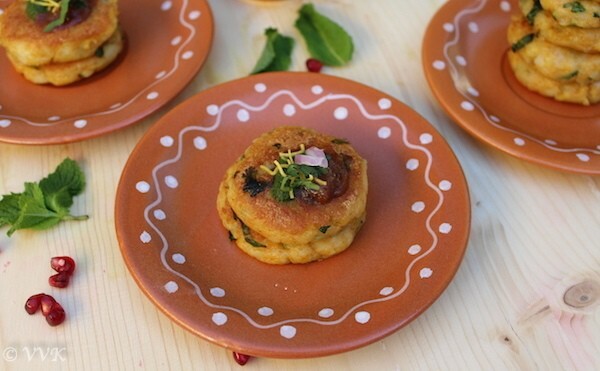 Aloo Tikki – yet another popular chaat recipe from India, which is pretty popular in other neighboring countries also. Aloo means potato and tikki means cutlets. These are potato cutlets prepared with boiled and mashed potatoes along with other spices. I prepared this as a “No onion No Garlic” tikki. 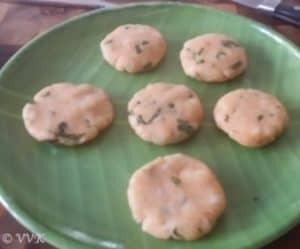 What I like about these tikkis is, they are perfect snack by themselves and they can be served in multiple ways and also they form the base for many other chaats too. This tikki can be served along with chole or just with green and sweet chutneys and that’s how I am presenting today. Nothing exotic and keeping it simple for today, but stay tuned for another interesting recipe with this aloo tikki tomorrow. 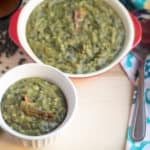 I love these tikkis as they follow my favorite principle “Prep Once Serve Twice” concept. :-) In fact I will be posting few recipes, which follow “Prep Once Serve Twice” concept in the coming weeks. 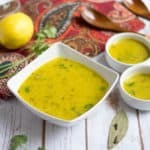 Cilantro, Sev or Pomegrante Arils as required. Boil the potatoes in you preferred way and let it cool down. Then peel the skin and mash it down. I microwave the potatoes without adding in water in the potato setting. So moisture content in the potatoes are comparatively less. But if you steaming in the traditional stove top method or pressure cooking, please remove the potatoes from water as soon they are cooked. If the water content is high, we need to add more corn starch and also we might end up using more oil while pan frying. 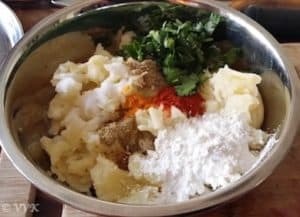 Mash the boil potatoes and to this all the other ingredients (Corn Starch, red chilly powder, chaat masala, jal jeera msala, salt and cilantro) except oil. Mix them nicely like below. Check for salt and spice. If required adjust the spices accordingly. Then pinch a small lemon sized balls and shape them into round balls like below. Then flatten them into small tikkis. Now heat the tava or wide skillet and add about 1 tbsps of oil. Reduce the heat to medium. Place about 4 to 5 tikkis and pan fry them till they turn brown on both sides. 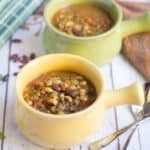 If required add 1 tsp of oil while flipping. I let them cook for about 1 minute one side and then flipped them and cooked them again for one minute. Then 20 seconds again on both sides. 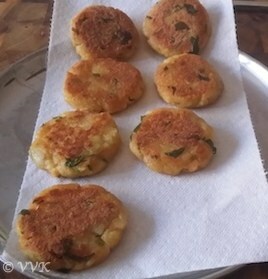 Here is my cooked aloo tikki. 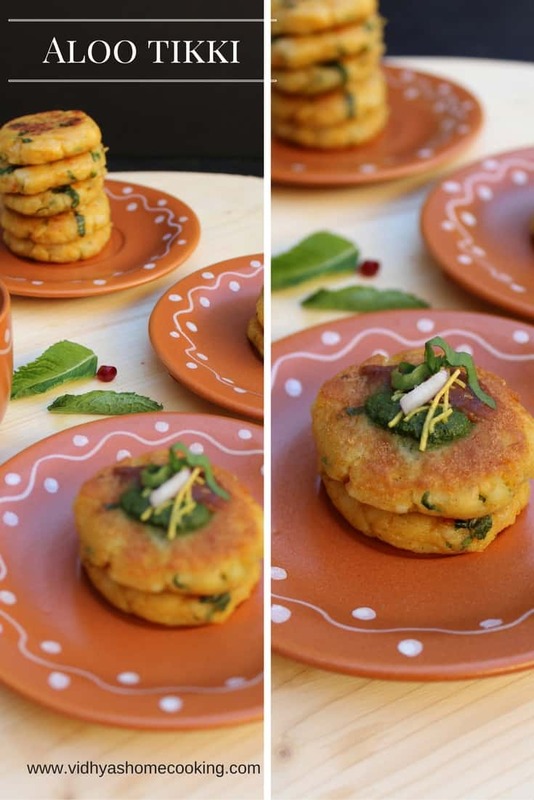 Aloo tikki can be served in multiple ways and can be used in many other recipes. But aloo tikki by itself is a filling snack. 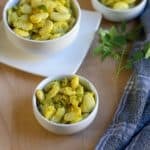 I just serve it with sweet chutney and green chutney topped with sev or just with ketchup. 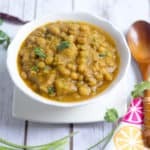 You can also serve this with chole. Stay tuned for another interesting recipe with these tikkis which is coming tomorrow. 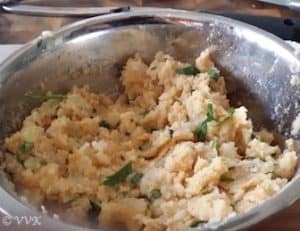 If the cooked potatoes has more moisture, more more corn starch while mixing. Grated carrots, cauliflower and cabbage can be added to make it veggie tikki. 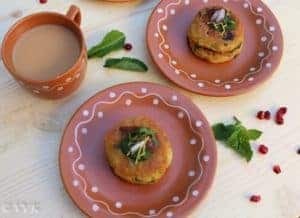 Indian Potato Patty - Aloo tikki is a spicy and savory potato patty which are pan fried and served along with sweet and green chutney. Cilantro Sev or Pomegrante Arils as required. Cook once serve twice is a lovely philosophy to follow. 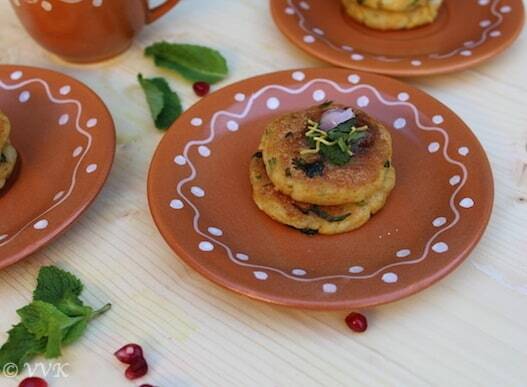 Aloo tikki looks delicious and those plates are awesome! 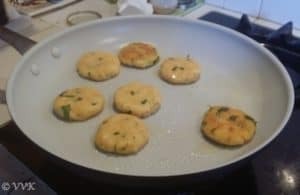 I love potato tikki — they are easy to make and so delicious. I loved the tikkis, and the plates look so pretty too. Nice collection you have there! Thanks Smruti. Got those plates here only. Lovely tikkis. I guess these are everyone’s favorite. Nothing like the classic aloo tikki!..lovely snack..
its way beyond dinner time here, but anything for these lovely Aloo Tikkis :) with RAgda its a treat ! glad ur kid likes all these! There tikkis can be served in many ways, as you said. How can one resist these!! Thanks Usha. Yeah love tikkis for that very reason. these are welcome at home any day!! 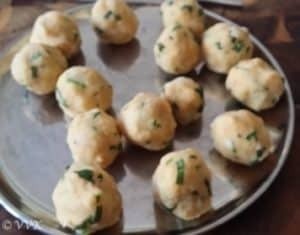 So perfectly made aloo tikkis.Love to eat them as such. Made these recently and just loved them. 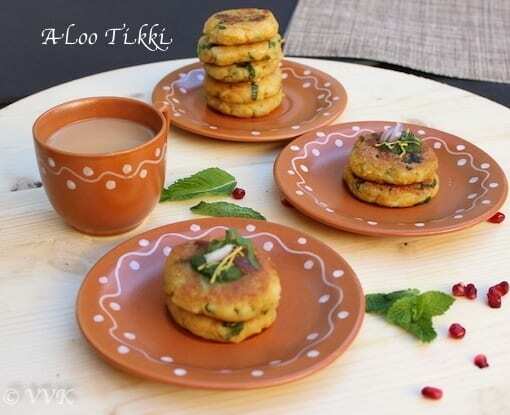 This is a tempting and guilt free snack..
With this tikkis,n number of chaats can be made,l looks so delicious.Love the way you presented it. Who can resist to these beauties, excellent aloo tikki, everyone’s favourite at home. Ah ! These aloo tikkis sound so amazing , perfectly made and ya I am looking forward to your next chaat , all time favourite food ! Wow !